I still want to get my hands on that, even though I know parts of it are no longer valid. So has anyone gotten their copy yet? Mine is still a few days out in the post. But online reviews seem promising. Though I did notice they have a stylized Yawning Portal... bad picture. So now we have yet another layout, apparently there are 3 floors of bar? Maybe they did renovations. ah, it had been over 100 years.... I can see renovations. I got a copy on Wednesday. It was fun putting names to faces! Mine is still on the way ! Alright I have mine in hand. Take everything with a grain of salt since I haven't read every page yet. 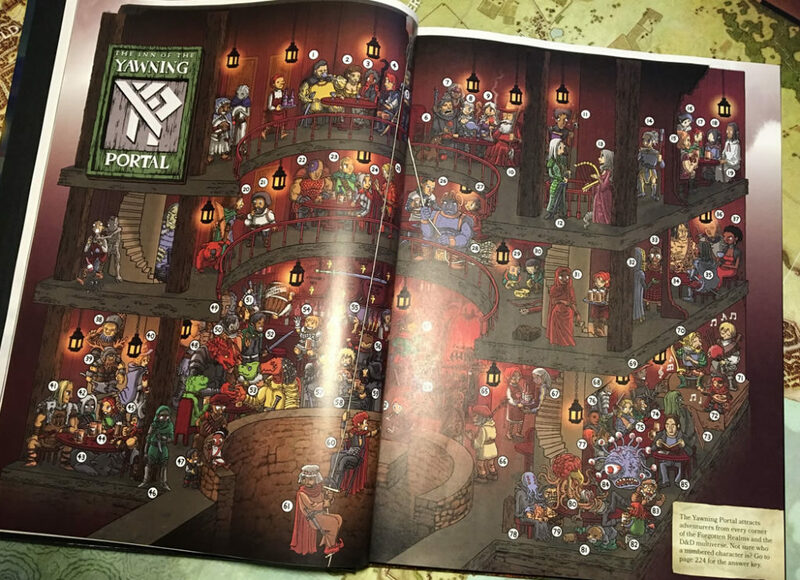 The text description of the Yawning Portal and the more realistic art in the book still have the bar/well as only on the first floor. So I'm guessing the cartoony art was just to be able to fit all those NPCs. Overall the book has a lot of good content and some interesting Waterdeep info. All the walking statues are named and described, I think that is a first. 20+ holidays are listed and described, many of which I'm sure we have info on already but they are all gathered in one place and there may be a new one or two in there. Coinage has been updated a bit and has some nice pictures. The book is full of great art throughout, a few double page spreads. Secret Lords and noble houses are left out mostly, aside from one noble house that can be chosen as the main villain. The book does focus on the current power struggles in the city with several groups of influence. Even the Lord's Alliance is used in the adventure a bit which I always thought was an underused/underrepresented in the past. And the guilds do play some minor roles here and there. The adventure, not a heist at all but a treasure hunt, seems like it will be fun. But after the first chapter you need a good DM to pull all the content together. Picking one of four villains and each villain getting their own season is nice. I really wish we got to play out an adventure over the course of a year and see ALL the seasons and thwart multiple villains. The adventure isn't replayable but it does leave you with extra content you can use for other things. Overall the book has a lot of details but the lore seems a bit shallow, there is a lot packed into these pages but it is by no means a must have book for Waterdeep. If you would like to run the quest, the updated info on the city is nice. If you don't care for the quest you are probably better off buying Sword Coast Adventurer's Guide and getting most the same updated info, without stats (who needs those), plus info for many other areas. Here's my two nibs worth, since I've been browsing my copy today. If you're getting Dragon Heist for lore, I'd wait for a sale. I'm having fun with the product, but it's so lore light it's borderline disappointing for me, which probably means it'll be a major disappointment to many here. I've found things that are new to me, but that could very well be because I've not processed all the other Waterdhavian stuff to the point I can look at anything "new" and go, "that's recycled from the boxed set" or "from Volo's Guide." I did like the DM's map for the fact it laid out some of the outlying farms, I don't recall that being a prominent feature before. I could be wrong. I'm not sure what new material the map was supposed to bring without changing the street layout altogether aside from that, though. I do like that we got stats for Jarlaxle and a few other characters. I almost laughed when I saw Volo's CR, I find it fitting and amusing, as a sort of snide joke. On a positive note, being lore lite as it is, it helps me, honestly. As much as I do thoroughly enjoy Waterdeep, with the Volo's Guides and Boxed Sets of the past, I find myself sitting and staring at a huge smorgasboard and not reading anything simply because I'm overwhelmed with delightful choices. As comical as it may seem, I feel like a dehydrated man coming out of the desert, finding water in abundance, and passing out from just sheer delight. This lore light gives me a starting point, it's the kind soul bringing the desert dweller a cup of water and a straw. It narrows things down for me to where I can pick something from the Volo's Enchiridion in the back, and then start perusing the indexes and tables of contents of prior books for more details. It makes the old stuff still relevant, if I want it to be, as well as keeps things simple if I need to strip it down. It's not for everyone, but it has its fun moments. I hope you're amenable to my reply to this within the framework of business analysis. If not, please let me know, and I will delete my post. I really feel that sadly in this case, it all comes down to the bottom line, though I do share your zeal for the idea of fresh, untapped areas of the Realms. Some caveats though regarding my analysis, first: though I am a marketer and economist by education and practice in business, I do not have access to anything internal to WotC, so my assumptions are just that: assumptions. As many have eluded to in the past, there were reported beliefs from marketing analysis conducted, that in order to prepare for development of the next market segment of customers into the future, they had to appeal to them. As many came to believe, 4th edition had a powerful sense of a tabletop RPG with a strong angle towards appealing to MMORPG'ers, as much as possible (I'm not saying that is good or bad, just neutrally commenting, and again just making assumptions here: no first hand knowledge). One of the chief complaints, supposedly, from that market cohort of 13 to 20 year olds from interviews and focus groups, was that they felt the Realms material had too high of a buy-in to assimilate due to the vast knowledge base of the existing Realms. In effect, that market segment, demographically and psychographically, did not want to feel like "noobs." Not a judgment again, rather, just an assumption that the marketing department was analyzing and trying to make what they believed were informed decisions in how to place their products in front of that up and coming generation of potential new customers. If that assumption is correct based on market research they may have conducted, it would stand to reason that any additional development of 'fluff' material would only stand to increase the divide between current and potential, new future users. Since WotC wants to know that they are going to sell those printed assets, they want to make sure they are accurate in advance. The issue though is that us Realms lovers, didn't respond well to that production response for 4th (as evidenced by their sales records) and they had to go into emergency mode. My interpretation of things now is, they are still slow walking things. They are producing the same material in 5th, that is effectively on par with what was printed in 3/3.5 (though they are even still deficit when compared to things such as 'The Lost Empires of Faerun', etc.). I honestly feel that WotC is reticent to print materials that are comprehensive, and even more engrossing, when they likely have other product lines that they have in the pipeline for future production. Anything that they see as a potential barrier to enter is going to make them leery to produce those items. I completely agree with you though man: I would love to see them dive into relatively not discussed areas such as Lapaliiya, Thar, Nelanther Isles, or fill-in the blank location. Heck, I think it would be fantastic if they would generate even greater depth and breadth of material on the soft sciences such as economics, sociological studies, philosophy, and even some more hard science material for flora/fauna and more. Who could ever tire of such a thing?! Thank you for your post Great Reader Irennan: I love discussions like this, and the freedom to post on things that some may even see as a sensitive subject, potentially. Hey, at least the world's not exploding for the 743668734th time. That aside, the Sword Coast has been overdone, true, but I'm a huge Waterdeep fan, I loved Death Masks (current time Waterdeep), and Ed seems to be involved in this, so I'll keep an eye on it. I only hope it won't end like the MToF. I was so excited for that book, and it ended up being an immense letdown. I hope they don't warp Waterdeep. Re: your point about appealing to future customer bases, and 4e being marketed to MMORPGers, a TTRPG will never offer the same kind of immediate satisfaction that a VG does, and between playing a VG and D&D, someone who wants a VG-like experience will play a VG. Emulating VGs is not something that TTRPGs do well, their strength is the kind of freedom and story/world depth that it can offer. I was supposedly part of the target audience for 4e FR, but I was not attracted by it in the slightest. In fact, I was turned away and led to seek previous FR products. Then again, the approach of 5e is different: both rule-wise, and Realms-wise, and 5e is as popular as D&D has ever got, so I guess that--unlike 4e--they're doing things right, from a business standpoint. I really appreciate the response on this: thank you. Though I was very insulted by the 4th edition push from WotC insomuch as it affected the Realms as it did, from a marketing standpoint I got their point, I just feel it was wrong. I have heard others from your demographic comp say similar things. I mean, it makes perfect sense. If the assumptions I posed were indeed accurate to what their marketing team had been working on, I stop to wonder how they went about the interviews and focus groups for their purported target market in the first place? Marketing research is a savagely hard discipline, and the right people really need to be on board to conduct those forms of analysis, otherwise you get.....well.....I think we see what happens, lol. On a personal note, I certainly am glad to hear that their marketing decisions to push their product line as they did, drove you to the earlier materials. That couldn't have turned out better I think! So, have you tried other systems such as 3.5/Pathfinder as well as 4th and 5th? If so, how did those systems come across to you? They are producing the same material in 5th, that is effectively on par with what was printed in 3/3.5 (though they are even still deficit when compared to things such as 'The Lost Empires of Faerun', etc.). I came in at the tail end of 2E, played/DMed all the way through 3/3.5E and even grabbed 2 or 3 4E books. I dare say overall 3/3.5 was nearly on par with 2E as far as lore was concerned. You mentioned Lost Empires, there was also A Grand History of the Realms, Races of Faerun, Power of Faerun, Faiths and Pantheons, the Tearing of the Weave set of three adventures, plus two of the early 3E books Into the Dragon's Lair and Pool of Radiance. When you compare it to 2E it still seems a bit sparse till you take into account all the online content much of it by Ed himself. As far as rules go 3/3.5E can't be beat. For the most part it was fully thought out and the number of options and combinations was amazing. Many would say there was too much room for abuse but that was up to DMs to keep in check. 4E rules were just a mess. 5E actually seems fairly good, mostly because they went back to something very similar to 3/3.5E. I think the real selling point of 3/3.5E was how well they merged lore and rules. Sure there were times books had "too much crunch, not enough fluff", like there could ever be too much lore. But it walked that tight rope the best any edition has, providing you deep interesting tidbits along with the numbers to run them in a game. I appreciate your thoughtful reply: thank you! I appreciate your indication of the volume of material produced in the different editions. You know, I've never gone and actually looked at the fully body between editions and juxtaposed it. Not to check, but rather, out of complete morbid curiosity, I feel I'll have to go do so to scratch that itch. I believe that it is Tethtoril's Bookshelf where I can find that bibliography, is that correct? I will also respond in greater depth to some other points you made, but I'm just about to head out the door for some family time, so I'll do so upon my return in a short while. I started with 4e in 2012, and I didn't mind it tbh, but we (I and my group) found out that we preferred a narrative/story-focused style, while 4e put a lot of emphasis on the tabletop game aspect. We switched to Pathfinder in the same year, and we had similar problems, so we ended up creating our own system from scratch. I found about FATE much later (2016) and found it to be much closer to our style than D&D, but we already had our system, so we stuck with it. 5e is very simple and streamlined, but we're not interested in it. In general, I'm not interested in D&D as a game, my interest is purely for the Realms as a world (even though, ironically, I don't really use it for my game. My world has elements inspired by the Realms, but it's not the Realms). That is interesting. I completely understand your desire for a narrative approach. I do use Pathfinder, but I've created a process, that has manifested over approximately 12 - 15 years of playtesting, where the RP has been placed back into the game, heavily, even when using Pathfinder, or any other system to be frank. Though, it includes a bit of heresy for a great many folk who laud strict adherence to the mechanics above all, haha. I do find that quite ironic that you don't use the Realms full on, with us being on this site of course; however, as is with my base heresy in creating such a change to my own game, the name of the game after all is....fun. I've heard of the benefits of FATE, and if I hadn't made the changes that I did to Pathfinder/D&D overall, I likely would have considered moving to such a system. I'm glad that the system works so well for you! My book just arrived. Man it is a work of beauty. The artwork is superb and I also really like the maps, including the fold out one. Great quality as always. So I've not gotten very far into reading this, but there's one thing that already bugs the crap out of me. In the description for the Xanathar Guild faction, there's the line "Few have any inkling that their boss is a beholder." And then the encounter that starts the adventure, a guy has tattoos of eyes all over his head, and in later encounters -- still in the beginning! -- there are multiple repetitions of the guild symbol: A circle with ten spokes radiating out from it. So no one knows there's a beholder around, but they just like to use beholder symbology without questioning it? Is there some well-known connection between beholders and human crime that I'm not familiar with? Furthermore, this is the 5E era -- which means that for more than a hundred years, this guild has been run by a beholder either named Xanathar (originally) or using "Xanathar" as their title. But no one knows there's a beholder running things -- which means that in one hundred years, no one that was knowledgeable about beholders ever heard that name and thought, "Hmmm, that sounds like a beholder name. I wonder if maybe this group using a beholder's name and beholder motifs is possibly run by a beholder?" Unrelated to all that, "Floon Blagmaar" is a horrible name. It sounds like it's a spur-of-the-moment, made-up alias. "My name, Guardsman with the sword in my face? It's uh, Flllloooonnn... Blag....Maar. Yeah, Floon Blagmaar!" Yeah, the name Floon Blagmaar is a bit odd. Also, my players found it highly suspect that both his name seemed fake *and* he was conveniently an almost perfect body-double for Renaer Neverember...so good that the Zhentarim and Xanathar`s Guild both mistook him for being the nobleman himself. As it currently stands, they are now more suspicious of Renaer and this possible coincidence that they happen to know each other than of the blaring plot point which is the gang-war in the streets...lol. I've not read that far into it... But so far as I know, there's nothing keeping someone from being a Moonstar and a Harper. I know the pre-Spellplague Harpers would have frowned upon that, if they knew, but I don't know if the 5E new/old Harpers care that much. I hate how Chris Perkins names NPCs. Breaks my immersion everytime. Wow Wooly, you don't know just how upset you've just made my cousin Floon�. he's speechless. I think you seriously cut him to the quick.